An increase in voltage for a very short time in a power system is called an over voltage. It is also known as the voltage surge or voltage transients. The voltage stress caused by over voltage can damage the lines and equipment’s connected to the system. Voltage that is too high can cause premature failure of electrical and electronic components like Computers, Monitors, Printers, PLC, etc. Almost anything with a printed circuit board. This damage is cumulative and irreversible. Frequent episodes of mid-over voltage can result in the same amount of component damage as a few episodes of severe over voltage.Surge Protection Devices (SPD) are used for electric power supply networks, telephone networks, and communication and automatic control buses. A Surge Protection Device (SPD) is a component of the electrical installation protection system. This device is connected in parallel on the power supply circuit of the loads that it has to protect as shown below It can also be used at all levels of the power supply network. SPD connected in parallel has a high impedance. 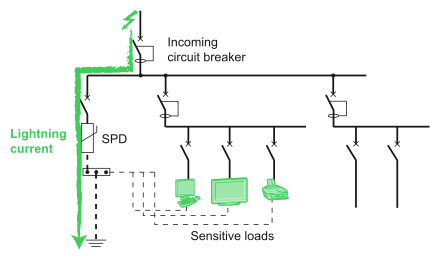 Once the transient over voltage appears in the system, the impedance of the device decreases so surge current is driven through the SPD, bypassing the sensitive equipment. • where a large number of individuals at the same location could be affected. This regulation also states that in all other cases a risk assessment according to Regulation 443.5 should be performed in order to determine if protection against transient overvoltage is required. If such a risk assessment is not performed, the electrical installation should be provided with protection against transient overvoltage. If your not sure whether you need surge protection or require more information, please call the team and we will be happy to help.